Snowmobiling is a thrilling yet risky way to enjoy the great outdoors. Before you turn on the engine, it is wise to learn how to properly operate the mechanical controls and safety devices of the vehicle. It is also important to read the owner’s manual and take a safety course. Don’t let an accident or injury ruin your day – keep your rides scenic and safe with the following safety recommendations. 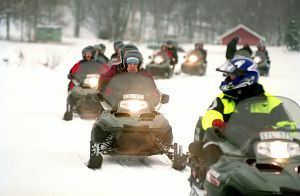 Inexperienced riders are much more likely to be involved in serious snowmobiling accidents than their seasoned counterparts. Therefore, you should contact your province’s Ministry of Natural Resources for more information on available safety courses for both adults and young riders. In most provinces, they are mandatory for extremely young riders (ages 10 to 15) if they intend to ride off their parents’ property. For more inforation on training, check out the ATV Safety Site and the Alberta Snowmobile Association.